Congratulations - you’re almost ready to bounce! 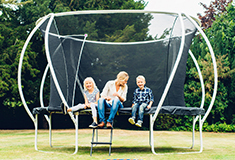 Our top ten tips to choosing the best trampoline for you. A galvanised steel frame will guard against rust – if it’s galvanised inside and out, even better. Look for a thick gauge of steel – the weight of a trampoline will be a good indicator of this (the heavier, the better). When it comes to springs, longest is best! Longer springs typically mean a bigger bounce. Plum trampoline springs are coated with zinc which helps to protect against rust for long-lasting play. On larger trampolines, a welded leg and frame joint is often a weak point, so it’s a good idea to look for versions with extra reinforcements in this area such as clamps or brackets. Plum’s Tramp Klamp bracket reinforces the joint for additional strength and durability. 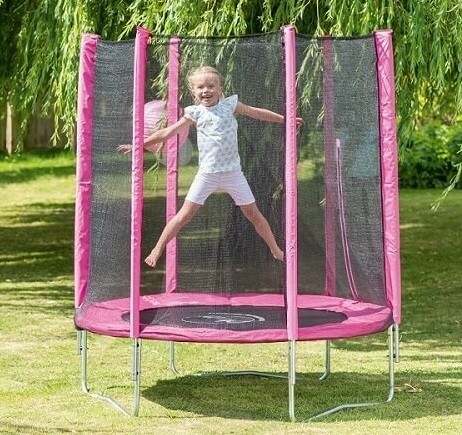 Trampoline enclosures are essential for safe jumping and garden trampolines that meet the European safety standard can’t be sold in the UK without one. A strong enclosure net will catch bouncers if they fall. You might want to choose a model with an enclosure that has a top rim for reinforcement – the top rim stops unsightly sagging and looseness in the net. 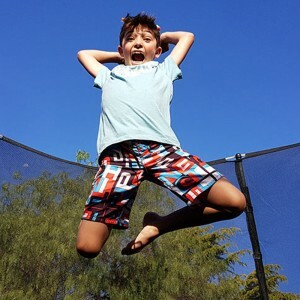 Lots of modern trampoline enclosure designs provide a barrier between the jumper and springs, giving extra protection for little fingers and toes. Plum’s 3G enclosures separate the jumper and springs but curve outwards to maximise bouncing space. Safety pads cover the springs and frame parts and help to protect bouncers as well as spectators. Choose a version with thick padding and weather proofing and it’ll last longer too. Want a long lasting trampoline? Look for words such as ‘galvanised steel’, weather protection and UV treatments - these technologies are all designed to keep your trampoline tip top for longer. Consider the age of the users. 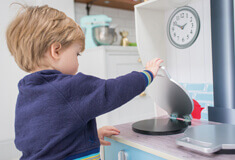 Large ‘traditional’ trampolines aren’t suitable for little ones under six years old, as they have a bigger bounce and are required to be higher from the ground. Plum’s Junior Trampolines are designed to help little ones to build up their jumping confidence until they’re ready for the real thing. Don’t forget the details. Your trampoline will get lots of use - look for a trampoline that has been rigorously tested and has an after-sales service and readily available spare parts. Photographs can be deceiving and you will need to allow enough space for the trampoline as well as a 2m safety perimeter around the edge. It’s a good idea to map out the area of the trampoline using a hosepipe before you buy to make sure you’re happy with the size. Consider the age of your children when looking for a trampoline. Lots of large trampolines are only suitable for older children aged six and over, due to frame height that they need. 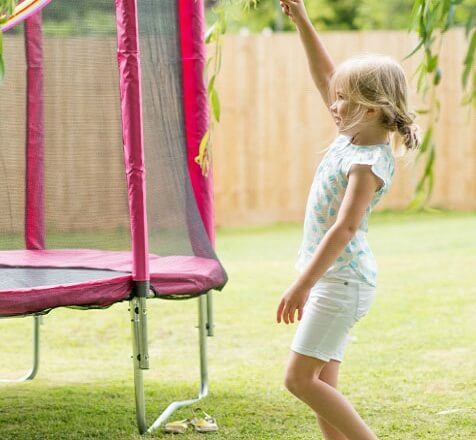 For little ones, Plum’s Junior Trampoline is a safe and secure way for children to learn to bounce until they’re ready for the real thing. Find the perfect spot for your trampoline before you start building as you won’t want to move it too often. Choose a flat, level spot on soft ground such as grass or bark. 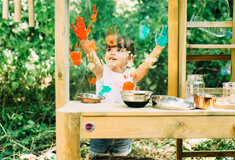 Find a spot away from obstructions such as fences, buildings and other play equipment and free from hanging obstructions like trees and washing lines. 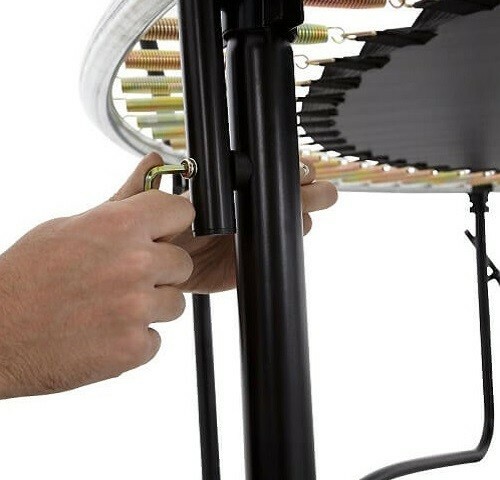 All of Plum’s trampolines are supplied with assembly instructions developed by our in-house product team of experts. When putting on the springs, start with 12 o clock and 6 o clock intervals, then 9 o clock and 3 o clock, before filling in the gaps. 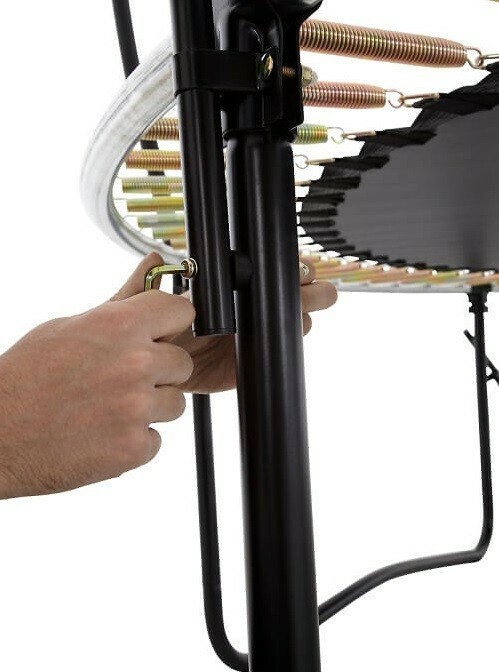 This helps to distribute the tension in the springs evenly, making them easier to fit. On larger trampolines, adding the springs and jumping mat may cause the frame to curl up. This phenomenom is so common that we’ve given it it’s own name - pringling - because of the shape it makes! Carry on with the building and once the trampoline is fully assembled things should straighten out. Struggling with the enclosure net? Check the manual closely. On some trampolines the door must be over a gap in the legs or the net won’t fit properly. Finished assembly? Don’t forget to do a final check to make sure all bolts are tightened and knots are secure before letting the jumping commence. Look after your trampoline and it could last a very long time! 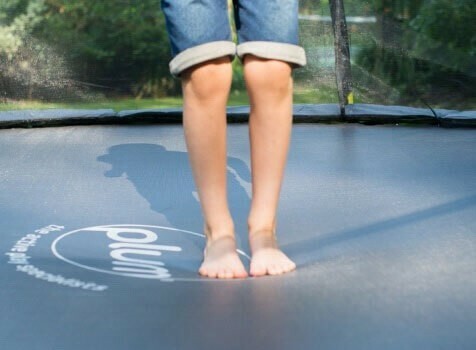 Most trampolines have to withstand lots of use so it’s important that you regularly check your trampoline for signs of wear and tear to keep it in safe working order. Any damaged parts will need to be replaced before the trampoline can be used again. Spare parts can be purchased on our website. During the winter months dismantle your trampoline and store it in a dry place as this will prevent rust as well as damage to the frame, springs and enclosure. In windy conditions it is important that you move your trampoline to a sheltered area, remove the enclosure and secure the frame to the ground using a trampoline anchor kit. 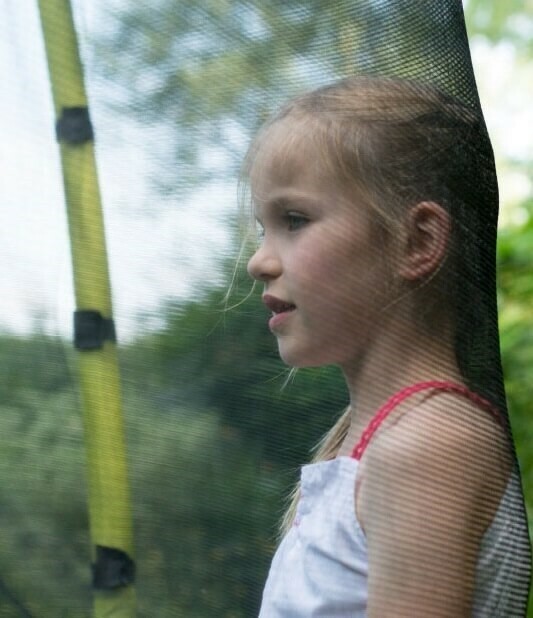 Bouncing alone is great but a few trampoline accessories can enhance the experience and help preserve it’s life. Plum's Trampoline Accessory Kit has everything you need to complete your trampoline! 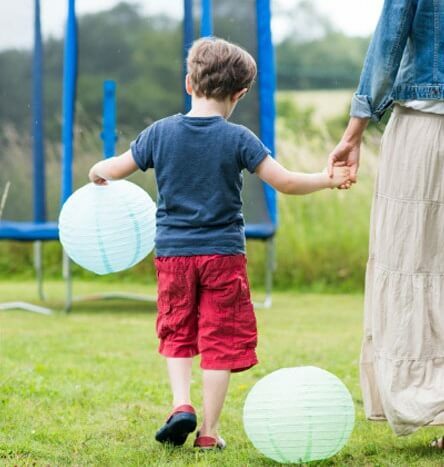 The accessory pack includes a Trampoline Ladder, Trampoline Anchor Kit and a Shoe bag. Trampoline ladders provide a safe method for little ones to climb on and off their trampoline. An adjustable model fits different sizes should you want to upgrade. An anchor kit is essential for securing your trampoline to the ground during high winds. In strong winds, trampolines can easily blow into the air, causing damage to buildings, cars as well as the trampoline itself. We always recommend anchoring the trampoline. 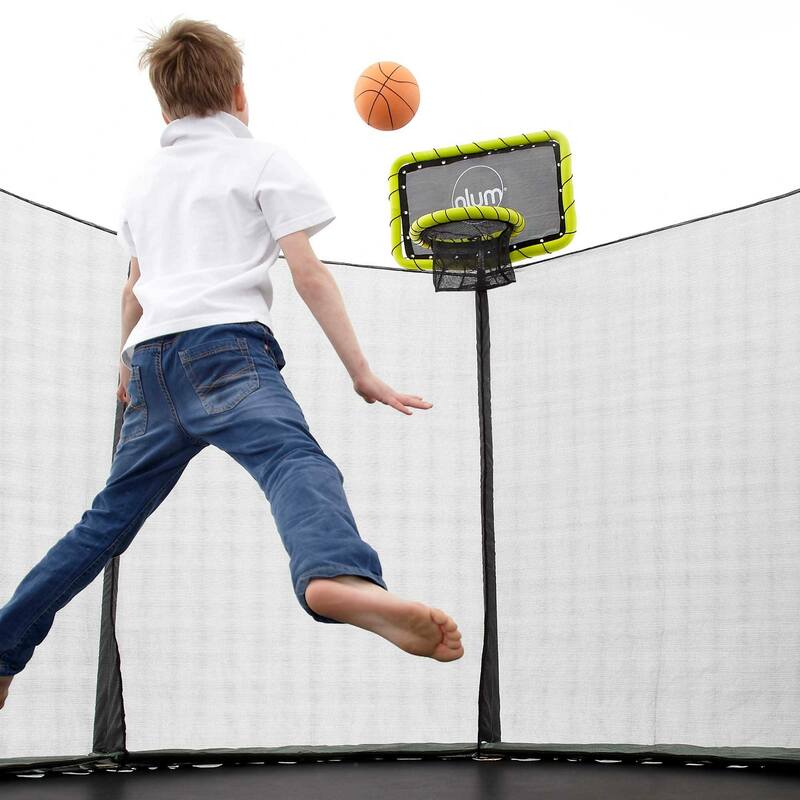 Our brand new Plum Basketball Set is the perfect trampoline accessory and will decide once and for all who has house bragging rights as the sharpest shooter in the family!! Turn your ideas into reality with Plum®. 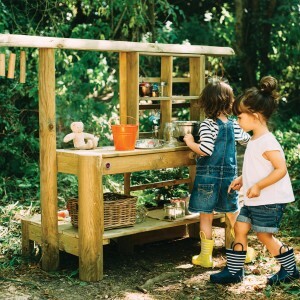 We're the leading outdoor toy specialist. opportunity to represent Plum® online.